We stumbled across a brand in Meherchand that is doing small batches of skincare products by combining natural African oils with Indian Ayurvedic practices. 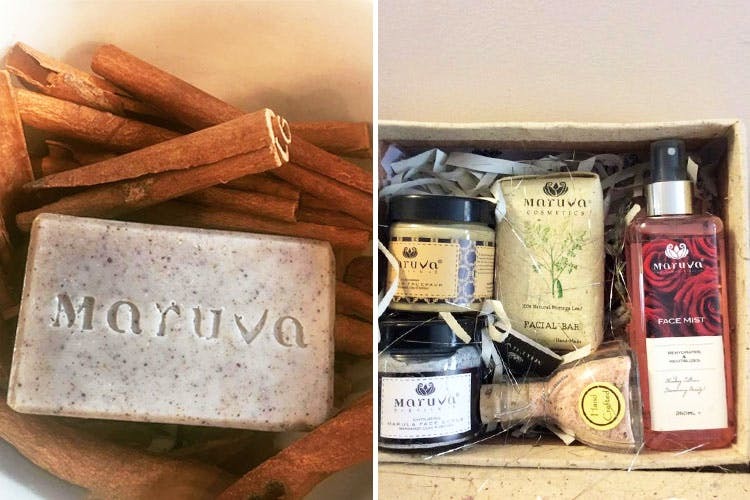 Maruva Naturals is winning for their handcrafted, safe products. The term Maruva itself means the oil of a flower—they cold-press natural extracts and use them for their products . Using oils and butters from Africa and the ancient art of Ayurveda (their products are formulated according to Vata, Pitta and Kapha skin types) they’ve come up with a range of natural, paraben-free products for hair and skin care. Their massage oils and hair oils especially have raging reviews. They have products for men and women, and a range of spa oils and candles for everyone. Their Baobab oil is especially popular for dry hair, damaged skin and reducing blemishes. We hear good things about their refreshing soaps, natural sunscreens and body oils. The Mafura butter day and night cream is one of their most popular products; we’ll definitely be trying those out. Men should give the Marula shaving cream a shot (Marula works wonders to reduce ageing), because its infused with sandalwood and almond, restoring your natural glow and soothing any inflammation. It helps with razor-burn and leaves you feeling fresh-faced.